Take the Fight to the Eternal Empire in the Newest Episodic Chapter: Profit and Plunder! BioWare™ and Lucasfilm released the latest episodic chapter of Star Wars™: The Old Republic™ – Knights of the Fallen Empire. Take the fight to the Eternal Empire in a clandestine heist to plunder Arcann’s secret vault. In a daring mission to recover the Eternal Empire’s vast riches, players will lead the adventure partnered with the galaxy’s most legendary thieves: the suave con artist, Gault Rennow, and the infamous Twi’lek rogue, Vette. Prepare to risk everything as you embark on a covert mission against all odds to take back the Empire’s stolen wealth! · New Game Mode: Become the Eternal Champion as you take part in a new gladiatorial challenge and take on the most notorious and skilled warriors in Zakuul. Earn unique rewards as you fight your way through ten deadly bosses in the Eternal Championship, each of which are progressively more difficult to defeat. 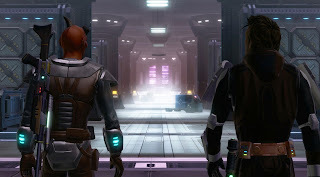 · New Alliance Mission: Join forces with the loyal Wookiee Bowdaar, as he plans to end the brutal blood sport with citizens of Zakuul. If he’s going to be successful however, Bowdaar needs a brave gladiator to enter the Eternal Championship and gain the respect of his fellow fighters. · New Plunderer Cartel Pack: Inspired by the latest Chapter, the new ‘Plunderer’ Cartel Market Pack offers players the opportunity to get rare heist-themed items, including Gault’s Triumphant Predator’s Armor Set, Vette’s Shadow Corsair Armor Set, and much more! Find out more about the ongoing story of Star Wars: The Old Republic – Knights of the Fallen Empire at www.StarWarsTheOldRepublic.com/Fallen-Empire .